Microsoft's $15 million investment into Foursquare could soon start paying off, as the local information provider's data is being integrated into Cortana (the virtual assistant built into Windows Phone 8.1) and suggests local places including restaurants, bars and points of interest for users. 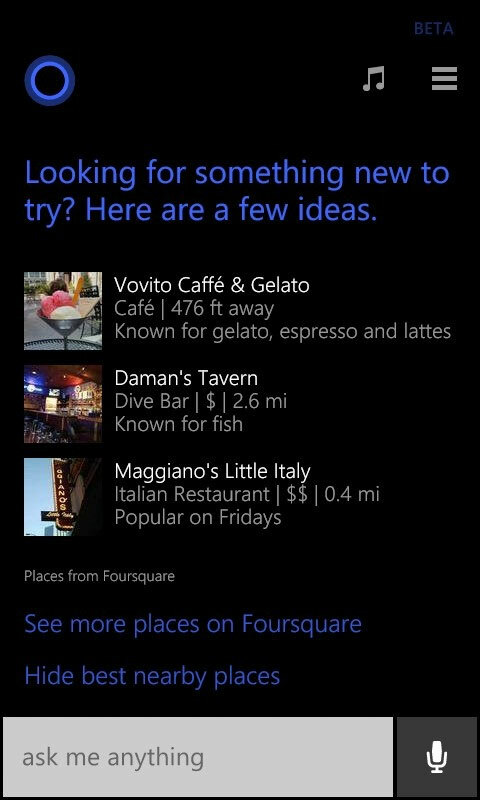 The Cortana integration comes just as Foursquare is trying to reinvent itself, spinning off its location-based check ins into a separate app called Swarm, while turning the main Foursquare app into more of a Yelp competitor for recommendations. "This is another example of how the Bing platform is making Microsoft services more personal, helpful and intelligent," said Elan Levy of the Bing Platform Team. "Instead of you having to manage multiple services and apps, the Bing platform processes the places and events around you delivering the information you need at the right time. This is another step to make the world’s most popular services available to people on Cortana via the Bing platform. Stay tuned for more in the coming months."